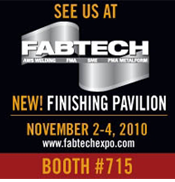 Tools USA and Paint-Booths will be attending FABTECH 2010. FABTECH is North America’s largest metal forming, fabricating, finishing and welding event with over 1,000 exhibiting companies. Previous Previous post: Be Advised – The New NESHAP rules could affect your business! !